The first batch of JioPhone units will become available Tuesday, August 15 as beta trials of the 4G feature phone are scheduled to commence today, a little over three weeks after it was unveiled at the Reliance Industries AGM 2017. This, of course, does not mean the handset has been released in the market, only that Reliance Jio has made it available to a select group of users to test it out before its public release in September - the phone is being beta tested by Jio employees for now. The Jio Phone beta trials will allow the company to identify and iron out software and hardware issues before it goes in the hands of consumers in September. JioPhone has several feature that have not been commonly seen on feature phones, such as 4G VoLTEInternet, compatibility with multimedia apps, and option to mirror content to television sets via a proprietary cable. This beta trial period will allow the company to test how these features, along with the other features the handset has, to iron out the kinks. As was the case with the Reliance Jio telecom network, the JioPhone beta trials will likely be limited to employees of the company, and people in their network. While the 4G feature phone will not be available to use for consumers till September, bookings for the device will begin both online and offline on August 24. Gadgets 360 has discovered that certain offline retailers in the Delhi-NCR area are already taking JioPhone bookings, ahead of the official schedule. You will need a copy of your Aadhaar card to make the booking, and only one unit will be made available to a consumer. If you want to book multiple units, the only option is to make a bulk order in the name of your organisation; the company’s GSTN or PAN will have to be provided for the bulk order. If you book a JioPhone offline right now, the device will be delivered between September 1 and September 4. The Rs. 1,500 refundable security deposit will have to be paid to the retailer only at the time of picking up the handset, not while booking. To recap on the JioPhone, the entry-level phone will come with unlimited voice, data, and texts. Customers will have to recharge with a Jio Dhan Dhana Dhan monthly pack of Rs. 153, which will give them free voice, texts, unlimited data (high-speed data capped at 500MB per day), and free access to Jio apps for 28 days. At the 40th AGM, Ambani also announced an accessory called Jio Phone TV-Cable that will allow users to connect their phones with any kind of television sets. For connecting phone to TV, users will have to recharge with the Rs. 309 per month pack. 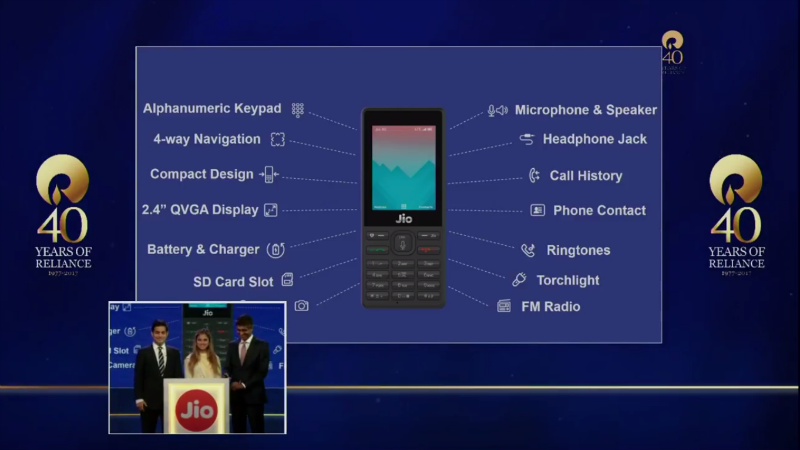 Talking about Jio Phone features, the device comes with an alphanumeric keypad, 2.4-inch display with QVGA display, microSD card slot, torchlight, FM radio. It will be a single SIM handset that works only on 4G VoLTE networks. The phone supports voice commands and 22 Indian languages, and has a panic button as well. A short demo of the voice command feature on Jio Phone was showcased during the keynote presentation where the device was able to play music via Jio Music. Additionally, the handset will also come with a panic button that is enabled when long-pressing the number 5. The Jio phone will come with NFC support for digital payments that will be rolled out to users via OTA software upgrade. Qualcomm and Spreadtrum have confirmed that their chips power the new feature phone. The phone does not have WhatsApp support at the moment, though we did catch glimpse of a Web browser, Facebook, and PM Modi's Mann Ki Baat broadcast during the unveiling at the Reliance AGM. The Jio Phone looks awesome but is there any catch? We discussed that on our weekly technology podcast Orbital, which you can subscribe to via Apple Podcasts or RSS or just listen to this episode by hitting the play button below.